The Marden House exhibits many elements that characterize Frank Lloyd Wright's Usonian style, particularly the concrete slab flooring, built-in furniture, and abundant natural views. The use of construction materials drawn from nature (opposite page, bottom) is in keeping with Wright's belief that buildings should grow naturally from their environment. Much of the furniture in the house was designed by the architect, including the cabinetry that runs across the far side of the living area. There has long been a sense among the collectors of artistic masterpieces that the paintings or sculptures they acquire never really "belong" to them in the traditional sense of the word. Great collectors are not owners, but rather stewards, entrusted with the preservation of a piece of history for the benefi t of future generations. Of course, this is easy to understand in the case of a Picasso or a Michelangelo...but what if the masterpiece were a house, on your property? 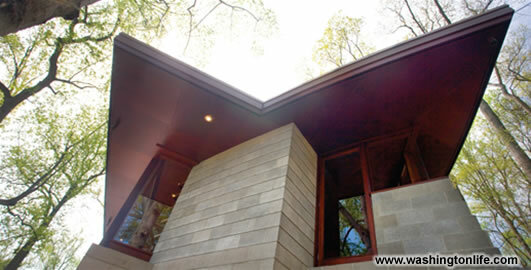 The restrained exterior features a flat copper roof . 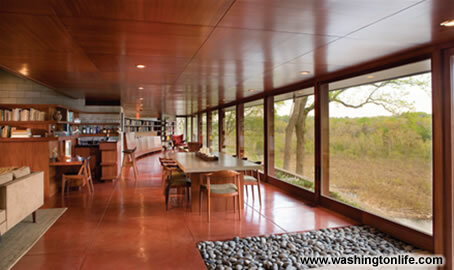 The half-moon space overlooking the Potomac includes glass curtain walls that Wright favored greatly over traditional siding. When viewed from above, facing downriver, the shape of the house hints at the prow of a ship. 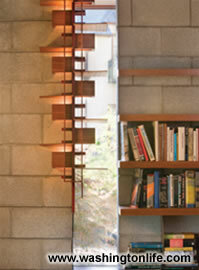 Natural light filters through slit windows, imbued with additional texture from a wooden sconce. 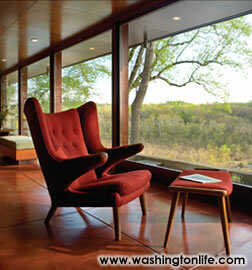 Wright's chaise and matching ottoman invite visitors to sit still while taking in the views of the Potomac. 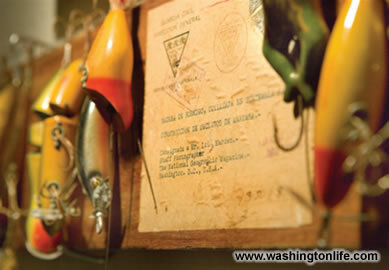 Assignments for National Geographic, Luis Marden enjoyed fishing along the Potomac. 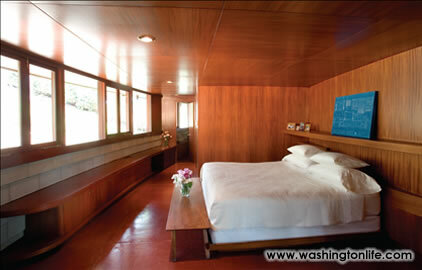 An original blueprint for the house helps to add color to the otherwise minimalist master bedroom. 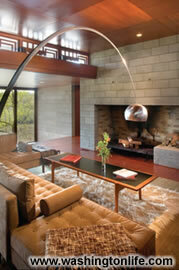 An iconic Arco floor lamp soars over the central living space toward a stone fireplace. Wright often described fireplaces as "the heart and soul of a house." This was precisely the question that Washington philanthropist and AOL co-founder James V. Kimsey faced when, in 2000, he purchased the property adjacent to The Falls, his 21,000 sq. 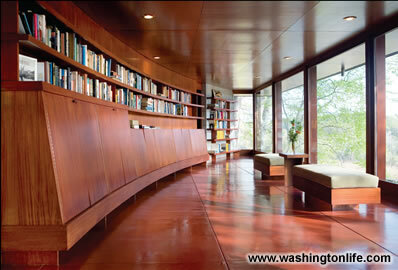 foot house overlooking the Potomac River in McLean. 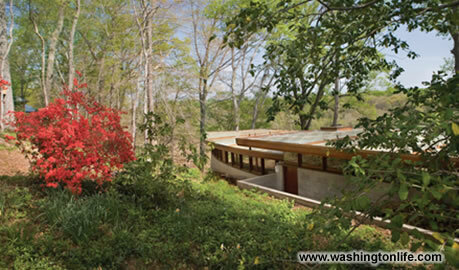 The masterpiece in this case was none other than a Frank Lloyd Wright house built in 1952 - one of only three properties that Wright designed in the Washington area. Known to Wright's disciples as the Marden House, this hemicycle design set into the rocky hillside was named after Luis and Ethel Marden, the photographer and mathematician couple for whom the home was designed. The Marden's occupied the residence until 2003. Presented with a choice, Kimsey decided to do what any steward of a masterpiece would, and he undertook its restoration to exactly what the artist intended it to be. Kimsey even visited Wright's archivists at the Frank Lloyd Wright Foundation, housed at Taliesin West in Arizona, and in 2004, he began the $1 million-plus restoration. The result is pure F.L.W., a cinderblock work of minimalist genius suspended over a torrent of rapids half a mile south of the Key Bridge.